The junk rig shares many of the virtues of the gaff rig. The "Junk" rig or "Chinese Lug" rig is easy to handle, very easy to reef, easy and inexpensive to build, easy to rig, has no complex hardware, requires no winches, is easy to maintain, involves very low rigging stresses, provides a low center of effort so requires less beam or depth of keel, and at least in my view, looks great! Michael Kasten. 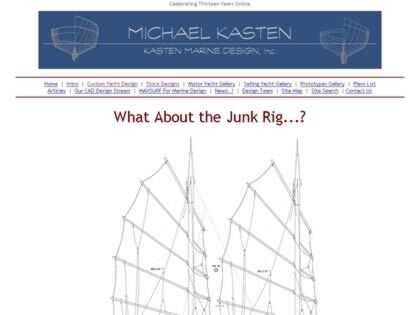 Web Site Snapshot: If available, above is a snapshot of the The Junk Rig web site at http://www.kastenmarine.com/junk_rig.htm as it appeared when this site was added to the directory or last verified. Please Note that Boat Design Net has no involvement with the above web site; all content and images depicted in the above thumbnail are the property and copyright of The Junk Rig unless otherwise noted on that site. Description: The junk rig shares many of the virtues of the gaff rig. The "Junk" rig or "Chinese Lug" rig is easy to handle, very easy to reef, easy and inexpensive to build, easy to rig, has no complex hardware, requires no winches, is easy to maintain, involves very low rigging stresses, provides a low center of effort so requires less beam or depth of keel, and at least in my view, looks great! Michael Kasten.